If you’re drinking one cup of coffee or more every morning, your drip coffee maker is probably a lot dirtier than you think. You may be under the impression that merely washing the carafe is good enough, but this is just not true. Changes are, your coffee maker isn’t getting the regular cleaning that it needs to remain free of germs and bacteria. To keep your coffee machine free of harmful bacteria, learn how to clean a coffee maker quickly and easily. According to a recent study, many coffee drinkers don’t think that their coffee machine is a hotbed for mold and bacteria. The study also discovered that the water reservoirs of coffee machines have a higher germ count than many spots in your bathroom. 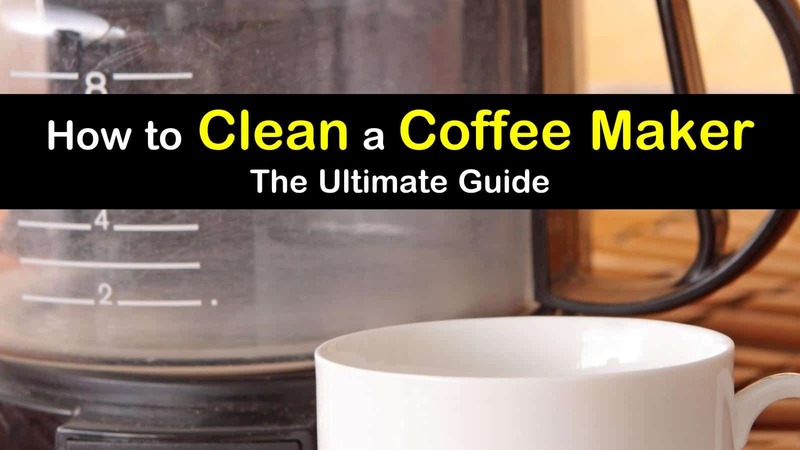 To ensure that you aren’t drinking up any mold, yeast, or coliform bacteria that has been known to grow in these appliances, learn the best way for cleaning your coffee maker with these simple life hacks. Mineral deposits, or scale, from water and coffee residue, can begin to build up in the various components of your coffee machine over time. This build up can not only affect the flavor of your coffee, but it can also cause the drip operation of your brewer to work less efficiently. While you can effectively clean your coffee maker with demineralized water, a commercial mineral deposit remover, or a specially formulated coffee maker cleaner, the easiest and most economical way to clean your machine is with vinegar and water. Here’s how to clean a coffee maker with vinegar. Start by emptying your coffee maker, making sure the filter basket is empty and correctly set. Rinse the coffee pot out with plain water. Remove the permanent coffee filter from the unit, as well as the water filter if your machine has one. Next, fill the water tank with equal parts of water and white vinegar. Then run the machine through a regular drip cycle. When the cycle is complete, turn the coffeemaker off and allow the vinegar and water to sit in the pot. This will remove any scale deposits that have built up inside the carafe. After a few minutes, you can discard the solution. Finally, you’ll need to run clear water, without vinegar, through the coffee machine at least twice. Be sure to allow the unit to cool down between the cycles. Running water through the device will help to remove any lingering vinegar solution. If your glass coffee pot is filthy, it can be more than just an eyesore, the old water stains and baked-on coffee can dramatically affect how the brew tastes. Similar to what we described in our iron cleaning tips, scrubbing the pot with hot soapy water, unfortunately, won’t remove the stains from the pot. Fortunately, with a little baking soda and warm water, you can get your glass carafe looking new. Here’s how to clean a coffee pot and eliminate hard water stains. Sprinkle some baking soda into the coffee pot, making sure to cover the bottom. Add enough warm water to the pot form a paste. Use a damp cloth to scrub the inside of the pot. The gentle abrasive quality of the baking soda will eliminate stains in mere minutes. Then rinse the paste out and use as usual. If you’re looking for a less, hands-on way to clean your coffee pot, you can use lemon juice. While this method will take a bit longer, it requires the least effort on your part. Like vinegar, lemon juice is a natural acid that can help rid your pot of stains. Add a cup of lemon juice to the pot and fill the rest with cold water. Let the cleaning solution sit overnight. The next morning, dump the liquid and wipe down the inside with a paper towel or soft bristle brush to scrub away the lingering stains. Rinse the pot and use a usual. Over the last several years, Keurig coffee machines have become a favorite system of coffee and tea lovers. If you have this kind of coffee maker at home, you know how crucial it is to keep it brewing every morning without issues. When used daily, these machines can develop clogs that will cause the unit to quit. Here’s how to clean a Keurig machine to keep it running well. Start by unplugging the machine. Then, disassemble and wash all the removable parts. This includes the water tank and lid, the drip tray, and the K-cup holder. Use warm soapy water to wash these pieces thoroughly, then allow to air dry. Next, use a clean, dry rag to wipe down the surface of the machine. Make sure you tackle the area around the coffee pod holder because coffee and tea granules tend to collect there. Return all the removable parts and plug it in. Next, fill the water tank with white vinegar or a specially designed descaling cleaner to help remove lime and scale buildup from inside the machine. Fill the rest of the reservoir with clean water. Run the device through a brew cycle, making sure to keep the K-cup holder empty. Repeat the process until the water reservoir is empty. The manufacture of these machines recommends doing this process every three to six months, depending on your water source. Repeat the process using plain water to remove any lingering vinegar taste. How Often Should You Clean a Coffee Maker? You should be washing the removable parts after every use. This is extremely important because it helps to remove coffee oils and coffee grounds that are left after the brewing process. Many of the pieces are dishwasher safe, or you can hand wash them in the sink with warm soapy water. Make sure that you also remember to wipe down the outside of the warming plate, especially if you have burnt on coffee from spills. You should also leave the lid of the reservoir open after each use so it can dry out completely. Over time the inner workings of your machine can build up with hard water minerals, making your coffee take longer to drip. To get your coffee maker back to working correctly, you should clean it with vinegar once a month. You can also use apple cider vinegar as a substitute for descaling your coffee machine if you don’t have any distilled white vinegar on hand. You should always thoroughly clean your carafe after every use to ensure you get rid of any germs or bacteria from the inside of the carafe. When the carafe starts to look dingy, you can quickly clean it using warm, soapy water and some rice. Fill the pot with a bit of rice and some water, then swirl the mixture around to loosen the gunk. Then use a soft scrub brush to remove the debris and rinse the pot out. If you are a coffee lover, then you know how convenient it is to have a coffee machine at home. However, without proper cleaning and maintenance, the high levels of moisture can end up harboring harmful mold and bacteria. It is essential to clean your coffee machine often to keep it working correctly and your coffee tasting fresh. 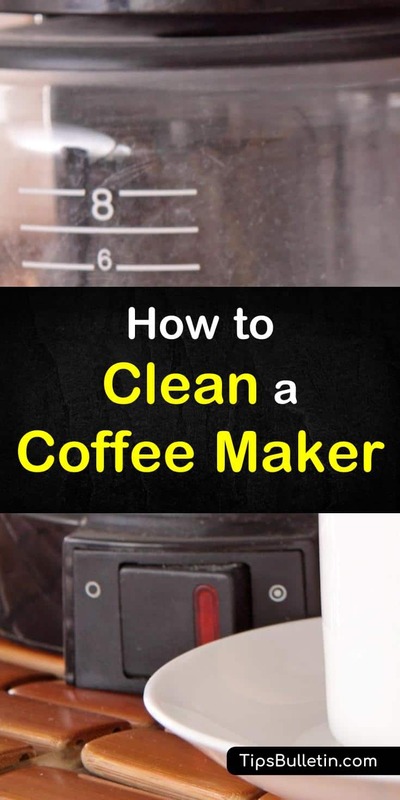 We hope you enjoyed learning how to clean a coffee maker. If you found the information in this article useful, please feel free to pass it on to all your friends and family.